Combining 30 years of professional musicianship with the natural ability to inspire children, Rhythm Child Drumming offers a variety of presentations for schools & events that are not only engaging, but can have a significant impact on the development of your children. As a REMO Endorsed Drum Circle Facilitator I have developed a comprehensive approach to music & drumming that fits into any school curriculum or family programming. Your school or community can feel the vibe and experience a fresh way of learning. 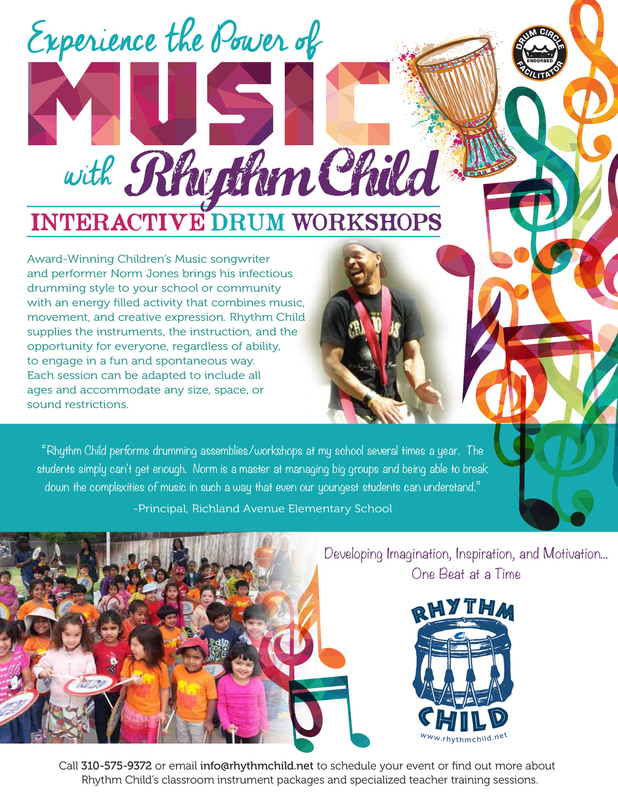 Contact us to schedule a Rhythm Child Drumming Event! Using the drum as an easily accessible vehicle to introduce various elements of learning, such as, phonics, math, physical activity & social dynamics. Large group presentation that promotes confidence & understanding within the frame work of a drum circle. Can be focused on a variety of themes. Facilitator guided family drum circle that uses humor and inspired energy to bring people together through music. Excellent for all ages regardless of size or ability. Example of multiple classes of Kindergartners participating in a 45 min. group activity.